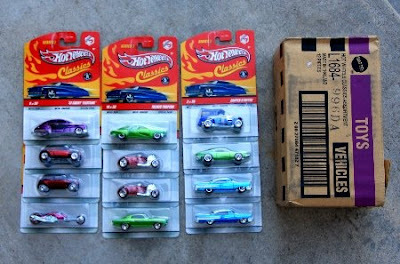 5th year of Hot Wheels Classics series, still remember my 1st purchase in Malaysia was at Mattel warehouse sale some time back. The Classics were never in Malaysia ever, and this will not for this year too. For series 5, Mattel picked some of the best-known muscle cars, hot rods, and Hot Wheels originals from the past 4 decades as well as 16 brand new models. A notable model for Malaysian will be the 2001 Mini Cooper, see picture below. Franky, if these in Malaysia, only and the only model can sell will be the Mini too. Too bad, American Classics, too foreign to us. i want to ask, do you know where can i buy a hotwheels-mini cooper miniature-red n black color here in malaysia? i cudn't find it. if u have any information about it, can u email me at sue_2785@yahoo.com. tq so much for your help. i'll try to scour for that mini cooper!! !